Halloween can be a tough time for families battling food allergies. The Teal Pumpkin Project works to make Halloween a fun experience for all, even those who may not be able to eat the traditional treats. Inspired by the efforts of a Tennessee Mom, the Teal Pumpkin Project is now a national campaign in its third year. By placing a teal pumpkin outside your home, trick-or-treaters know that there are allergy safe options. About one in thirteen Americans has a food allergy and with the majority of Halloween candy containing milk, nuts, soy, and wheat the holiday can quickly become more worrisome than fun. Providing things like glow sticks, toys, or crayons allow children to get the classic Halloween experience without putting their health at risk. 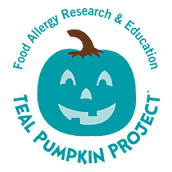 Hosting a teal pumpkin painting party prior to Halloween or passing out informational flyers from FARE (Food Allergy Research & Education) is a great way to make your neighborhood more allergy friendly on the 31st . If you are in need of nutritional guidance regarding food allergies the registered dietitians at Sage Nutrition are available to help!